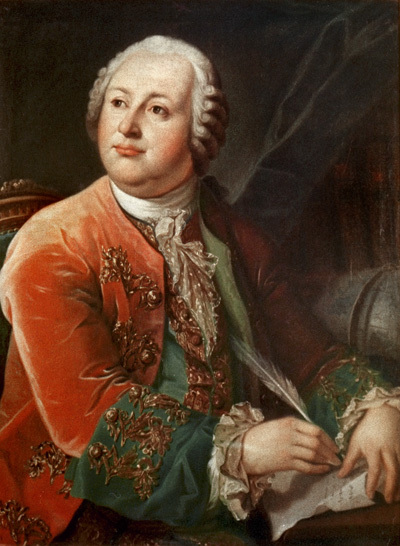 In the middle of the 18th century, during the observation of the transit of Venus of 1761, the astronomer M. V. Lomonosov (portrait) reported the presence of a halo which he attributed to the existence of an atmosphere around Venus. Since the 19th century, when the phase and the angular size of the planet permitted observations, dark spots or marks, generally in the equatorial region of the crescent, have been drawn and later photographed. It was in 1932 that CO2 was identified for the first time by observation of absorption bands in the near infra-red, around 0.8 mm, in the reflected solar spectrum, by Adams and Dunham. Constituents other than CO2 (CO, HCl, HF) were discovered with the instrumental techniques developed after the Second World War, including spectroscopy in the infra-red, but it was only in 1967, with the descent module of the Soviet probe Venera-4, that the concentrations of these constituents were measured in-situ for the first time. 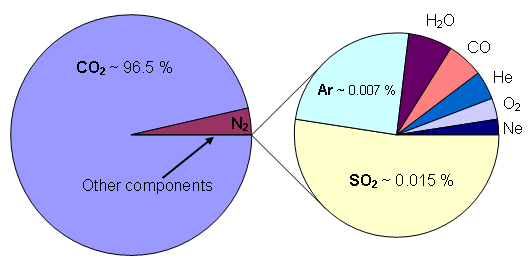 Carbon dioxide (CO2, 96,5 %) and nitrogen (N2, 3,5%) already represent more than 99,9% of the composition. Chromatographical analysis of the gaseous phase, from the automatic mission (1978), revealed new minor molecular constituents such as H2, O2, Kr, H2O, H2S and COS. The presence of sulphur dioxide (SO2) was established in 1979 by medium spectral resolution observations from the Earth in the near ultraviolet. Even in weak quantities, this very reactive gas is an essential element in the chemistry of Venus’ atmosphere. Water vapour was also detected, in extremely low quantities (about 30 parts per million or ppm, 1 ppm = 0.001 %), making Venus the driest planet of the solar system. The mixing ratios of CO, H2O and SO2 vary significantly with altitude and demonstrate reactions of chemical equilibrium between the different constituents. The troposphere of Venus does not receive sunlight at wavelengths below 400 nanometres, since the UV is absorbed by SO2 and the aerosols in the cloud layer. Even at visible wavelengths, only 5% of the sunlight reaches the surface. This is a major difference between the atmosphere of Venus and those of the Earth and Mars, which are quasi-transparent to sunlight. Since ultraviolet rays do not reach the troposphere, photochemical processes only play a secondary role there. The only notable exception is the photo dissociation of S3, which is due to tropospheric absorption of sunlight between 400 and 500 nanometres.